After the death of Moses the LORD’s servant, the LORD spoke to Joshua son of Nun, who had served Moses: “Moses My servant is dead. Now you and all the people prepare to cross over the Jordan to the land I am giving the Israelites. I have given you every place where the sole of your foot treads, just as I promised Moses. Your territory will be from the wilderness and Lebanon to the great Euphrates River– all the land of the Hittites— and west to the Mediterranean Sea” (Joshua 1:1-4, CSB). The land of the Hittites seems not to refer to the Hittite Empire of modern Turkey but the Egyptian and later Assyrian usage of this term to describe the region controlled by the Hittites in the western part of modern Syria. These lands and boundaries identify Canaan as it was known both to the Bible (Gn 10:19; Nm 13:17,21-22; 34:3-12) and to Egyptian writers of the second millennium B.C. In numerous passages the Hittites are mentioned as one of several groups populating the land of Canaan. For example, Joshua told the Israelites, “You will know that the living God is among you and that He will certainly dispossess before you the Canaanites, Hittites, Hivites, Perizzites, Girgashites, Amorites, and Jebusites” (Joshua 1:10; cf. Gen. 15:20; Deut. 7:1, and etc.). The Ankara (Capitol of modern Turkey) Museum is of international renown for its collection of Hittite artifacts. 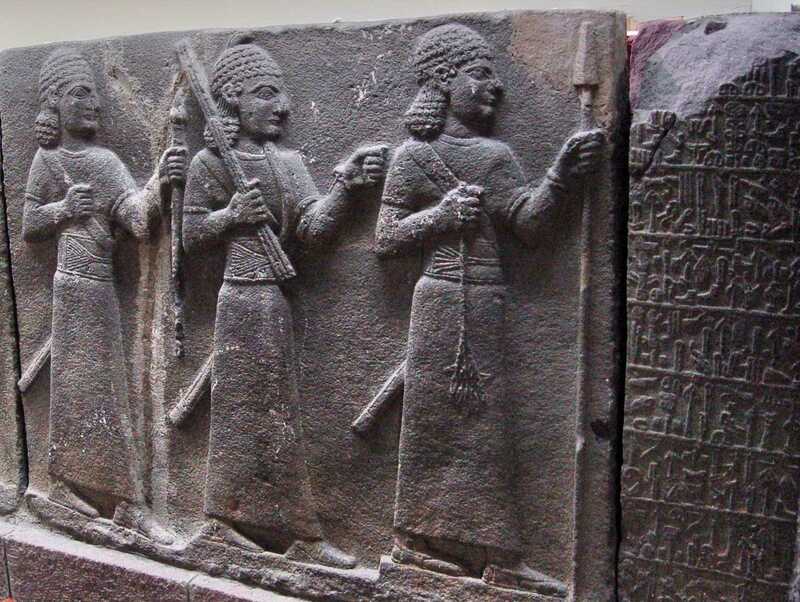 The relief below shows three Hittite warriors. Hittite Warriors. Ankara Museum. Photo ©Leon Mauldin. The Bible is not a book of fiction. When it mentions people, they were real people, living in real places, participating in real events as recorded in Scripture. This entry was posted on Wednesday, February 26th, 2014 at 11:31 AM and is filed under Bible History and Geography, Bible Study, Israel, Old Testament, photography, Travel, Turkey. You can follow any responses to this entry through the RSS 2.0 feed. You can leave a response, or trackback from your own site. I am looking forward to visiting the museum in Ankara in a couple months. I will probably take a similar picture. You will enjoy that. Thanks for writing.